Product #20466 | SKU 1SKB-R112AUV | 0.0 (no ratings yet) Thanks for your rating! 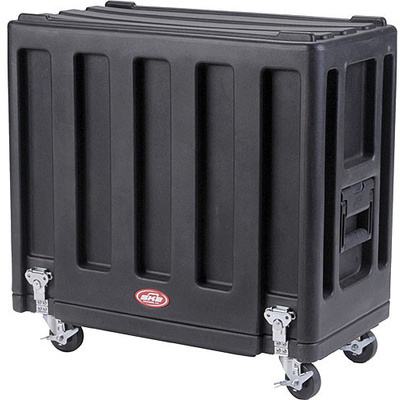 The SKB 1SKB-R112AUV Multi Purpose Utility Case with Wheels (Black) is a hardware case suited for storing and shipping a wide variety of gear. It is made from roto-moulded LLD (Linear Low Density) and LMD (Linear Medium Density) polyethylene plastic, with a deep design. Equipment can be held in place on a rugged rolling "hook and loop" fastener board with four adjustable corner cleats and a secure reverse-cinch belt. When equipment is in use, it can sit securely on top of the cover. The case is transported by comfortable over-moulded handles and a caster board with four easy-rolling 3.0" locking casters.